Fire crews tackled a blaze at Ikea in Glasgow which broke out in the early hours of the morning. Firefighters were called out to the store on Kings Inch Drive, near Braehead shopping centre, just after 04:10. The blaze involved a number of pallets. Four fire engines were at the scene at the height of the fire. The Scottish Fire and Rescue Service said there were no casualties and the building was evacuated. Crews extinguished the fire and left the scene by 06:40. 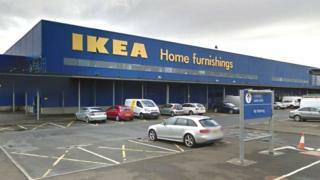 A spokesman said: "The Scottish Fire and Rescue Service was alerted at 4.12am on Friday, March 29 to reports of a fire within at IKEA on Kings Inch Drive, Glasgow. "Operations Control mobilised four fire engines to the scene, where crews extinguished a fire within the ground floor of a two-storey warehouse building. "A full evacuation of the building was carried out, and there were no casualties. "The last appliance left the scene at 6.39am after ensuring the area was made safe."